I firmly believe that the way you present things to your students matters. From boring points of grammar to challenging speaking activities, there is always a way to get their attention. I am of the opinion that students learn much better if you completely discard from your teaching the idea of boring master classes where the only person in the room seems to be the teacher and choose instead a more interactive approach. I try hard not to forget this student-centered approach during the whole lesson. There is also something I try not to forget. You learn better when you have fun! And here we go, for a lot of fun!! Aim: using the Present Perfect to talk about experiences. You never know where and who you’ll get inspiration from! I got the idea for this Speaking Activity watching Ellen Degeneres show.Have you ever seen her show? It’s hilarious! Anyway, she’s got a section called “Never Have I Ever” where she asks her guests questions and they need to put up a sign with the words Yes, I Have or I Have Never. This hilarious speaking activity is fairly simple and requires little preparation. ♥ Tell them you are going to ask a question to the whole class. ♥ Ask some students to explain their answers. It’ll certainly be funnier if you choose to ask some spicy questions like the ones Degeneres posed to her guests. Do you want to try? How would you answer these questions? Have you ever fallen asleep in the cinema? Have you ever read a whole Harry Potter book? Have you ever drunk while underage? Have you ever kissed someone on the first date? Have you ever aced a test without studying? Have you ever slept until 5 pm? Tired of always looking for exercises for different grammar points I have started putting together everything I need, related to a certain point of grammar, on the same page. 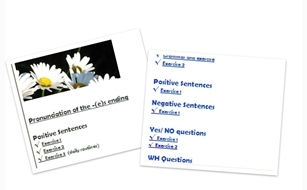 Today I have uploaded two more: Present Simple and Present ContinuousTense. I have gathered together Grammar and Exercises . Hope it is as helpful to you as it is to me. Now, I can safely take them to the computer room, ask them to go to this url where they’ll find everything they need to work on. Very useful too, to do as homework or revise just before exams at their own pace. ♥Click Present Simple and /or Present Continuous to start practising!! !